For this swap we will be exploring recipes that utilize a “roux” in it. A roux is made by cooking flour in a fat such as butter, lard, pan drippings, or ghee. By cooking the flour and fat together it creates a thickening and flavoring agent that is the base for gravies, gumbo, bechamel (white) sauces, stews, and more. It’s even possible to make vegan roux, so don’t be discouraged if you are! I personally use roux to make gravy for pot pies, pasta sauces, and cheese sauces. For this challenge find a recipe that utilizes a roux, make it, document it, and share it as outlined in the swap details below. Send your partners the recipe you tried. 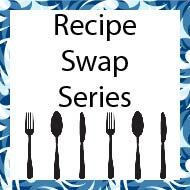 Make sure you include the recipe author and book/blog/website you got the recipe from if applicable. You must have a rating of 4.9800 or higher and I will ban swappers at my own discretion to keep this swap safe. You can send this swap as either an email or attach a file such as a PDF. Communication: If you are going to be late on sending please notify your partners as soon as possible. I will angel this swap if necessary after you have rated your partner(s) a 1.